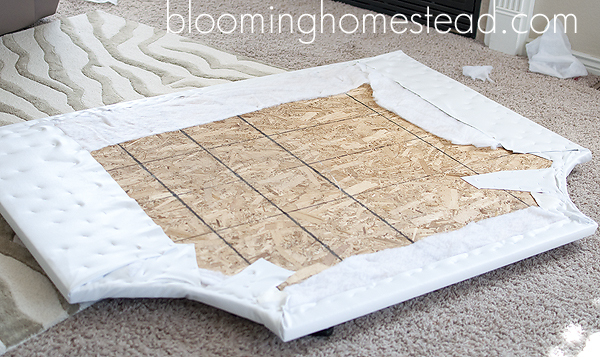 Pull it taut over the foam and the wood trim edging and staple it onto the back of the plywood. The low loft batting helps create a seamless effect to the foam and headboard and will make your fabric look much nicer and it isn’t too thick so it still allows your trim to attach with ease to the wood border. 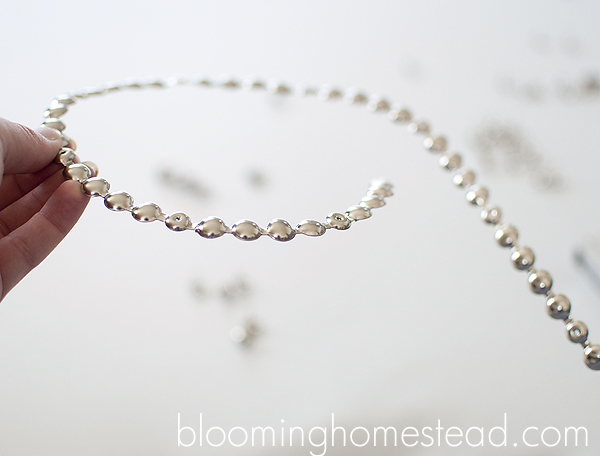 Now you are ready to attach your fabric. 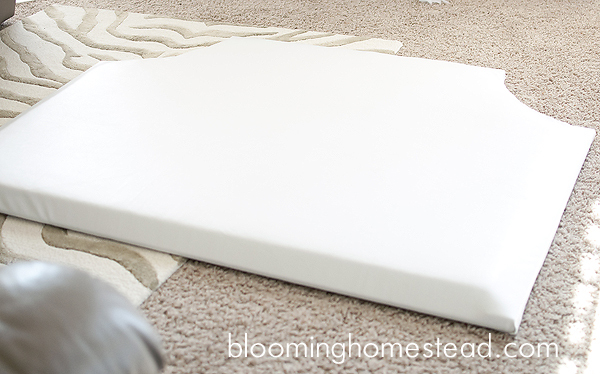 The easiest way to accomplish this is to lay the fabric right side down and place the headboard piece front side down on the fabric. 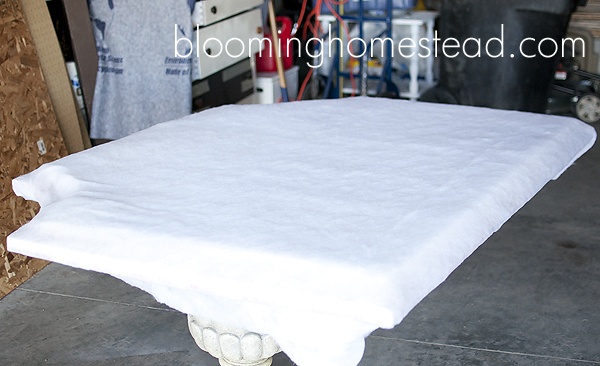 This is best done in a clean area like your house to prevent staining or damage to the fabric. 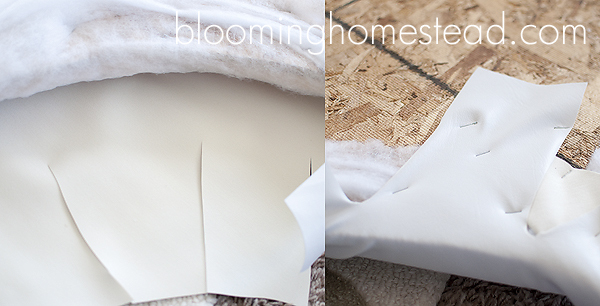 Make sure you work opposite edges and pull your fabric tight! I kept checking for bunching to make sure it was staying taut. 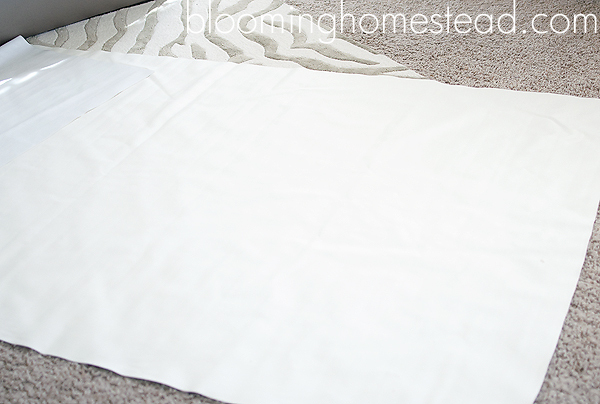 For the corners, I made sure to cut it into strips to help the corners so the fabric wouldn‘t gather and bunch. Then I pulled each strip tightly and secured it with several staples. Here’s how it was looking after I got the fabric all stapled on. 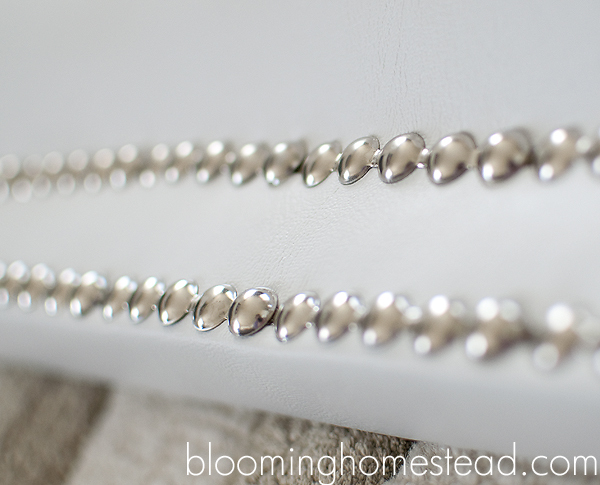 After I had it all nice and tight I turned the headboard over to check and make sure there weren’t any bunches and to prepare to add the nailhead trim! 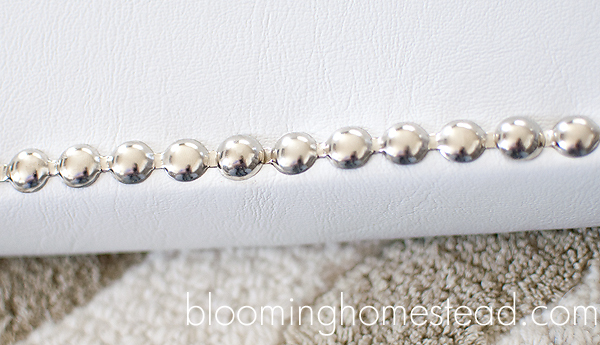 Open up your trim kit and start attaching the nail head along the outer edge of the headboard. 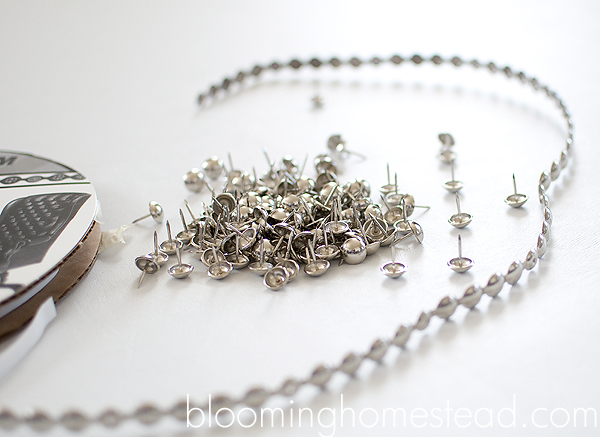 You’ll use a hammer to attach the nails down in the “empty” nail spots provided. I used my household hammer and it worked fine. 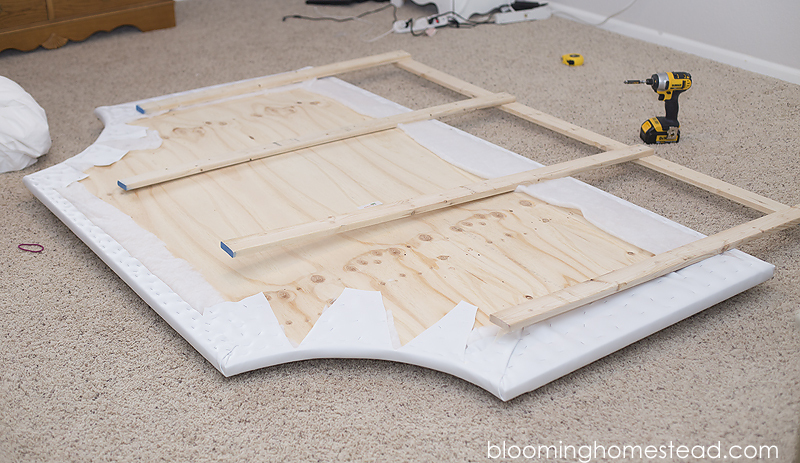 I decided to do the outer edge first so I used the side of the headboard as a guide and lined it up as I went along. Around the corners I bent it a little so that it would contour to the corner shape. 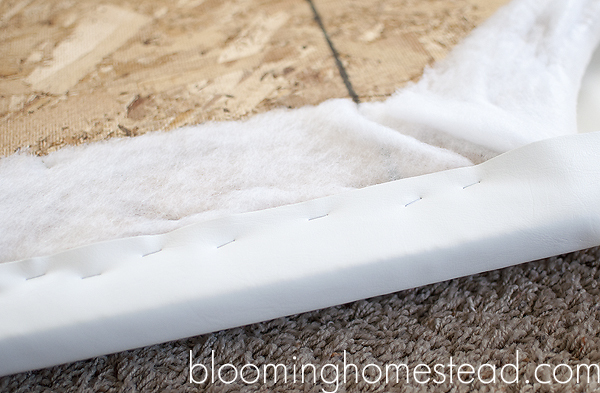 This trim kit was so easy to work with, I was so nervous but it really is so simple (and dare I say fun?) After I got the outer edge entirely covered, I needed something to help me evenly space the inner line to the outer line. 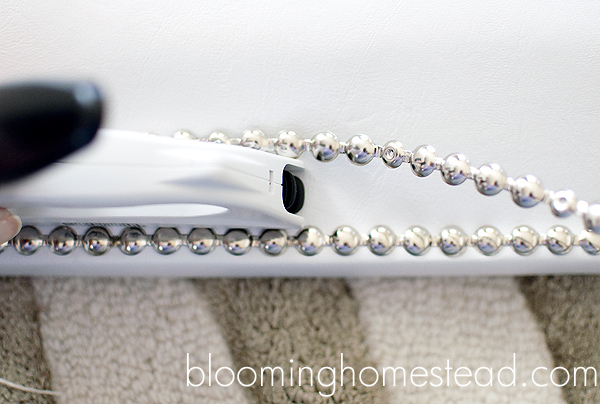 I decided that my staple gun was the perfect size and guide and it worked marvelously. I just kept measuring and moving it along. Pretty soon, I had the inner edge done as well. 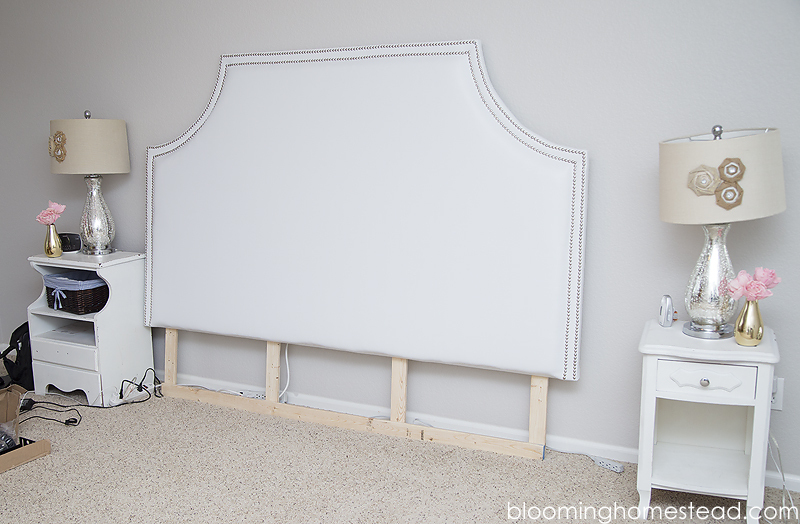 To mount the headboard and make it the right height, I used leftover strips of common board and screwed them along the sides, middle, and bottom of the headboard as a base. 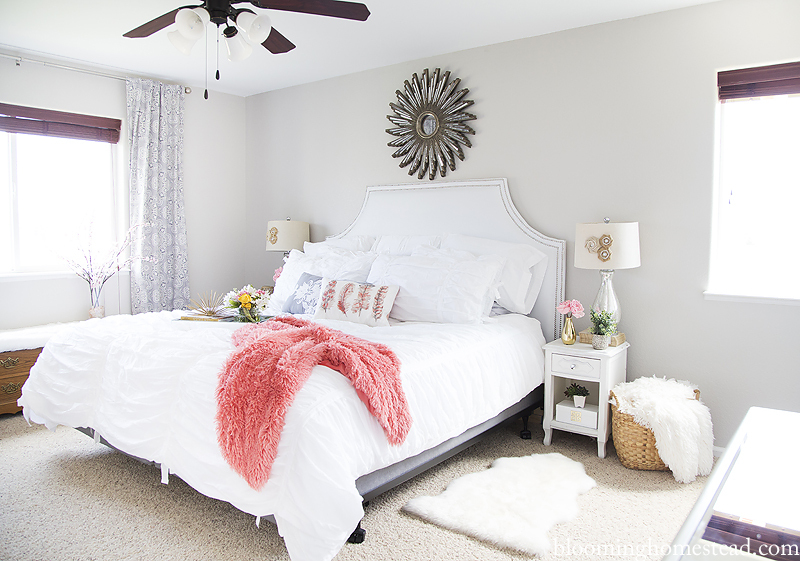 I’m so pleased with how the master bedroom is coming along and I’ll be sure to share updates when we finish the room makeover.